The Alexander Archipelago is a 300-mile (480 km) long archipelago, or group of islands, of North America off the southeastern coast of Alaska. It contains about 1,100 islands, which are the tops of the submerged coastal mountains that rise steeply from the Pacific Ocean. Deep channels and fjords separate the islands and cut them off from the mainland. The northern part of the Inside Passage is sheltered by the islands as it winds its way among them. The islands have irregular, steep coasts and dense evergreen and temperate rain forests, and most are accessible only by boat or aeroplane. The vast majority of the islands are part of the Tongass National Forest. In order of land area, the largest islands are Prince of Wales Island, Chichagof Island, Admiralty Island, Baranof Island, Revillagigedo Island, Kupreanof Island, Kuiu Island, Etolin Island, Dall Island, Wrangell Island, Mitkof Island, Zarembo Island, Kosciusko Island, Kruzof Island, Annette Island, Gravina Island, and Yakobi Island. All the islands are rugged, densely forested, and have an abundance of wildlife. The Tlingit and Kaigani Haida people are native to the area. The Tsimshian people found on Annette Island are not originally from the area, having immigrated to the region from British Columbia in the late 19th century. Ketchikan on Revillagigedo Island and Sitka on Baranof Island are the largest towns on the islands. The most populous neighborhoods of the largest town in the region, Juneau, are on the mainland, though portions of the city also lie on Douglas Island, which is a part of the archipelago. Tourism, fishing, and logging are the main industries of the islands. The archipelago was a locus of the Maritime Fur Trade during the early 19th century. Control of the islands passed from Russia to the United States with the Alaska Purchase in 1867. 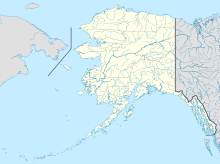 On an 1860 map of Russian America (Alaska), the island group is called the King George III Archipelago. ^ Golder, Frank Alfred and Leonhard Stejneger (1922). Bering's voyages: an account of the efforts of the Russians to determine the relation of Asia and America. New York: American Geographical Society. ^ Hayes, Derek (2001). Historical atlas of the North Pacific Ocean: maps of discovery and scientific exploration, 1500-2000. Vancouver: Douglas & McIntyre. ^ Hayes, Derek (1999). Historical altas of the Pacific Northwest: Maps of exploration and discovery; British Columbia, Washington, Oregon, Alaska, Yukon. Seattle: Sasquatch Books. ^ Hayes, Derek (2004). America Discovered: A Historical Atlas of North American Exploration. Vancouver: Douglas & McIntyre. ^ "Alexander Archipelago". Geographic Names Information System. United States Geological Survey. Retrieved 2018-05-22. "Alexander Archipelago". Geographic Names Information System. United States Geological Survey. Wikimedia Commons has media related to Alexander Archipelago.